When was the last time you held a roll of 35mm film in your hands? For a vast majority of folks, it's been a while seeing as how most cell phones now pull triple duty as our comms, our cameras, and our pocket computers. But getting photos and files off your phone has always been a sticking point—you either have to run cables to your computer, email yourself the files, or entrust your sensitive data to some company's insecure cloud. With SanDisk's new Connect line, you'll never have to deal with cables or clouds again. And they won't anchor down your wallet, either. 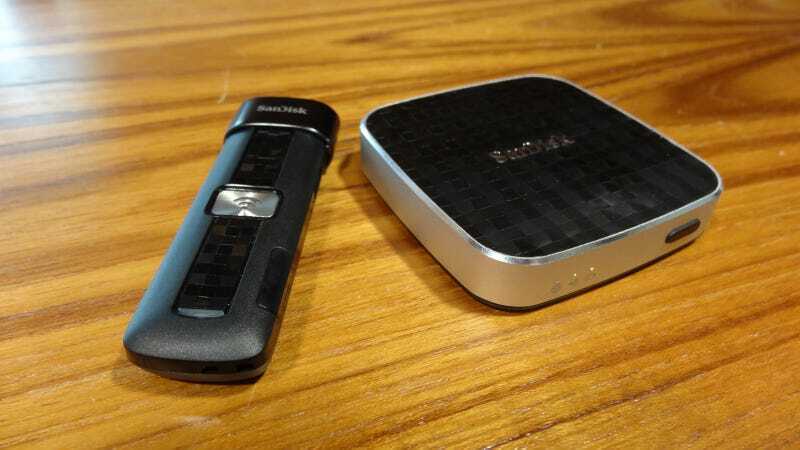 The SanDisk Connect line allows you to wirelessly transfer data from your mobile device onto an external storage device, namely SanDisk's Connect USB or Connect Wireless Media Drive, using the device's integrated access point. So, for example, say I want to move the 2 GB of pictures that're clogging up my gallery off of my phone. Normally, I'd have to upload them to Dropbox if I was somewhere with a Wi-Fi signal or physically tether it to my laptop with a USB cable if I wasn't. But with the Connect, I simply hop onto the USB's secured access point with my phone and transfer the files wirelessly using the SanDisk Connect App. I can then either transfer the files to a laptop using its USB port or share them wirelessly among up to eight devices. The Connect USB will be available in 16 and 32 GB varieties, $50 and $60 respectively, and are available for pre-order from Amazon today. A two-hour charge provides four hours of continuous runtime, and it's able to stream up to three separate video streams simultaneously to eight connected devices using its 802.11 BGN radio or on the web at Sandisk.com/WFD. Unfortunately, you can't actually use these access points to surf the web. What's more, the drive's 16/32GB MicroSD card will be swappable, allowing you to load multiple drives with media for sharing. The device's management app is available for iOS, Android, and Kindle Fire right now, though SanDisk is reportedly working on one for WP8 as well. The Wireless Media Drive works essentially the same way as the USB but offers better performance and more storage. The Media Drive will be available in 16 and 32 GB for $80 and $100, respectively. Runtime and streaming capabilities are both improved with a three hour charge delivering five hours of continuous operation and up to five simultaneous 720p streams to eight connected devices. Plus, the Media Drive includes an SD slot allowing you to either pull data off the internal memory or a swappable SD card/adapter. Unfortunately, the device does not support SD cards higher than their native capacities so you can't expand its capacity with a spare 64GB+ SD card. The Media Drive's management app will be available at launch for iOS, Android, and Kindle Fire. And while the Media Drive can't compete with the Seagate Wireless Plus in terms of storage space (64GB vs 1TB) or include USB 3.0, it's a viable half-priced option—with an additional five stream capacity—for people that don't need to carry a terabyte of content with them at all times. Besides, 64 GB of space will store roughly 16 movies at 720p; how much more do you really need to share?